Valentine’s Day in Paris. Doesn’t it sound romantic? It is! 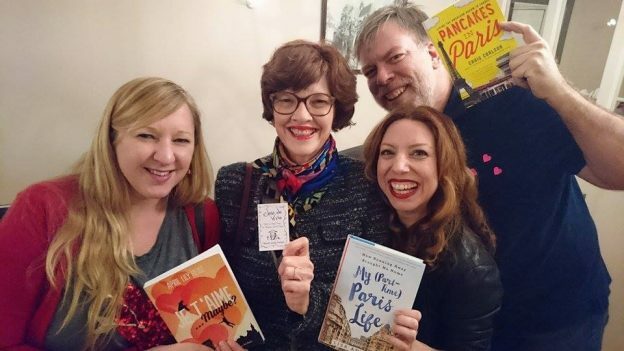 I kicked off the pre-Valentine’s day period by attending a reading by three American writers celebrating their love affair with…Paris. Held at the Paris Culinary Institute on the Quai de l’Hôtel de Ville, the event featured a drinks hour which consisted, among other things, of delicious red velvet pancakes (yes, I said RED) graciously furnished by none other than Craig Carlson, the author of Pancakes in Paris: Living the American Dream in France. Craig knows a thing or two about pancakes and Paris, being the owner of the fabulously successful Breakfast in America diners in Paris. Anyone having the erroneous idea that buying a restaurant in Paris is the stuff of dreams would do well to read Craig’s book. Craig is not only an observer of French life. He is deeply IN it and that includes all of it, not just discovering a better view of Notre Dame (from the back instead of the front) but dealing with France’s excruciating illogical labor laws – and that includes a stint in a Parisian jail cell. The chapters in which he tries – and fails – to fire employees who are sluffoffs or worse are absolutely priceless and absolutely true. I haven’t had time to read the books by the other two authors, American Lisa Anselmo and Canadian April Lily Heise, but am looking forward to them. Lisa’s book is called My (Part-Time) Paris Life: How Running Away Brought Me Home“; it is the tale of how she fled to Paris after the death of her mother from cancer. April Lily (she told me she goes by Lily) Heise presented her second romance memoir, Je T’Aime…Maybe?, the sequel to Je T’Aime, Me Neither. From the humorous excerpts that Lisa and Lily read from their books, it would seem that finding one’s true love with a French man in Paris is more compliqué than it looks and fraught with cultural misunderstandings. True confession time: I wasn’t sure I’d attend the event. I thought I had overdosed on memoirs by foreigners recounting their lives in France. That is rather ironic considering that (she says modestly) I started the trend way back in 1997 with my first book, French Toast. In those faraway days, other than than the best-selling A Year in Provence by Peter Mayle and the cleverly titled French or Foe by the late and regretted Polly Platt, there were few books in this genre. Hey, it wasn’t even a genre yet! Publishers being conservative, they were looking for the next Peter Mayle and my book was rejected more times than I’d like to think of. But – a message of hope for discouraged authors – a good publishing house did pick it up and it’s still out there. Pat on the back: Diane Johnson, author of the best-selling Le Divorce and two-time finalist for both the Pulitzer Prize and the National Book Award, called French Toast “the gold standard of books about the French.” Persistence pays! The pre-Valentine’s Day reading by three talented, ebullient, energetic and enthusiastic authors changed my mind about avoiding “books like mine”. Each story is different and there’s plenty of room for all. What can be more enlightening and entertaining than to read about the experiences of people who, for whatever reason, have decided to slip out of their “comfort zone”, turn the tables, rip up their roots and settle, for a while or forever, in the City of Light. The picture above shows left to right, April, Harriet, Craig and Lisa. I’m not holding up my latest book, Joie de Vivre, because I didn’t have a copy on me. (Another message to authors – always walk around with copies of your books). As you’ll see, I did though have my visiting card with its cover! Happy Valentine’s Day to all and here’s to love for Paris and love in Paris! This entry was posted in Uncategorized on February 12, 2017 by harriet.welty.